3استادیار گروه توسعه روستایی، دانشکده کشاورزی، دانشگاه صنعتی اصفهان. 1M.Sc. Students of Rural Development. Rural Development Management Department, Yasouj University. Although different governments place a lot of interest in developing rural tourism targets and a lot of budgets are spend in this respect, less attention is paid to study the attitudes of the host communities towards tourism. 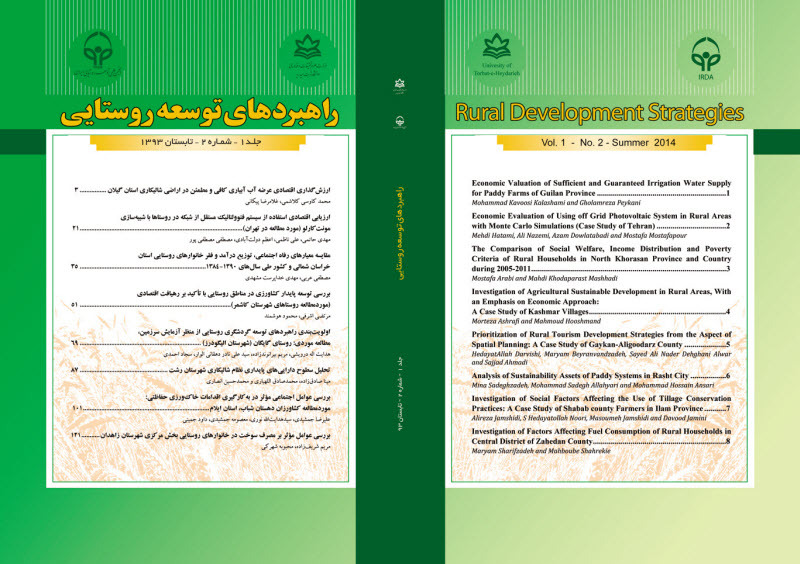 Thus, the aim of this study was to analyze the factors that can affect the attitudes of rural people towards rural tourism in the Doroodzan District of the Marvdasht County. The research was conducted in 2015. The survey research method was used for this purpose and data were collected using a pre-designed questionnaire. The research sample included 250 villagers that were selected using Kerjcie and Morgan Sampling Table and the Random Sampling Technique. The Face validity of the questionnaire was verified by the expert faculty members and the staff of the Rural Development Management Department of the Yasouj University, and its reliability was also verified by calculating Cronbach's Alpha reliability coefficient (from 0.61 to 0.86) that was obtained from a pilot study. The results of the Path Analysis showed that value of tourism is the most effective factor for predicting the respondents' attitudes towards rural tourism. Next to that there are other variables such as income from tourism and observation that have had the most effect on the respondents' attitudes. Finally, it is recommended that the means of mass media such as local radio and television broadcast services prepare programs and campaigns about rural tourism and related topics in order to improve the attitudes of the rural people towards rural tourism.